You are here: Home / Before & After / Does Your Car Have Dents From a Garage Door? Does Your Car Have Dents From a Garage Door? As soon as you hit the button you realize your hatchback or trunk is still in the up position and down comes the garage door to dent your car. You aren’t alone! We see examples of this type of dent in our retail shop and the good news is, we can fix it for you! Our trained technicians use PDR or paintless dent repair to gently massage the metal back into place without repainting the car. This is a more economical way to repair your car versus traditional body shop work. Here’s an example of a 2013 Toyota Sienna repair. 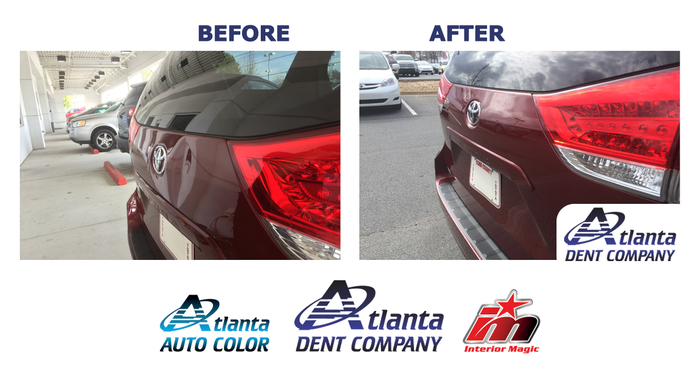 We work on all makes and models so don’t worry, Atlanta Dent Company will make your car “look and feel new again!” And, if it’s not a new car to begin with – we can work wonders for you! Stop by 993 Mansell Road, Suite B in Roswell to see all the services we offer with Interior Magic and Atlanta Auto Color. You can upload your photo here for a FREE Estimate.